According to a chart released on the Detroit Free Press website on April 6, Elberta has been placed on a state financial watch list and is “flagged for possible state intervention.” We scored an 8 out of 10 based on our fiscal 2009 audit. Frankfort, meanwhile, scored an impressive 2, placing it in the category “neutral—no action necessary” (view the breakdown for Benzie County here). 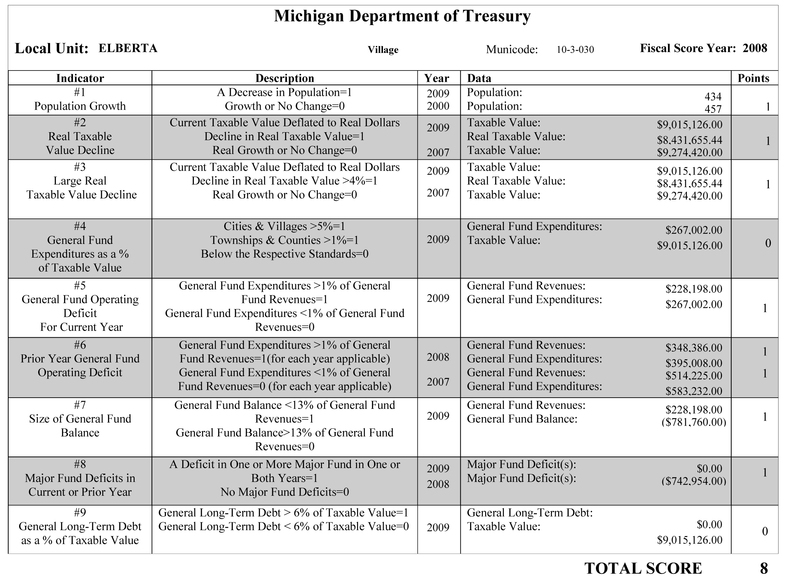 Elberta did remarkably worse than any other Benzie County entity. Gilmore Township was also in the neutral clear as of 2009, with a score of 3. On March 16 of this year, Governor Snyder signed into law the Local Government and School District Accountability Act (hereafter referred to as Public Act no. 4). This law allows the governor to put local governments and schools under financial review. If the appointed financial reviewers determine that the local entity is in sufficient financial trouble, the local government or school board will be disbanded and governance will be assumed by appointed officials—the so-called Emergency Managers. These managers will have the authority, without public input, to do what they deem necessary to get the municipality or school back in the black. This could presumably include deciding to sell off key assets, close schools, raise taxes [according to the FAQs about the act posted on Treasury’s site, “An Emergency Manager cannot impose taxes, over and above those already authorized, without the approval at an election of a majority of the qualified electors voting on the question. However, an Emergency Manager is authorized to order one, or more, millage elections for the unit of local government.”—Ed. ], cut programs and commissions, and eliminate other expenses. According to Stanton, “These fiscal indicator scores have no correlation to the statute [Public Act no. 4],” and are provided simply as information to local governments to help them assess where potential problems may lie. Rather than the fiscal indicator scores, Treasury will be watching for the occurrence of any one of the 18 “triggering events” listed in the Act (see here). A few examples of trigger events include: (a) The Village Council might actually request that it be preliminarily reviewed; (b) a creditor may write to the state claiming that a payment from the Village is six or more months past due; (c) the local government might fail to “timely file” an annual financial budget; (d) the Village may end a fiscal year in a deficit condition. Any one of these trigger events could, according to Stanton, prompt a preliminary review. And any one of these triggers could happen here. So far, according to Stanton, Elberta hasn’t hit any of the triggers in such a way as to elicit a preliminary review, and Treasury has no current plans to conduct a review of Elberta. For one thing, said Stanton, the data reflected in the fiscal indicator scores is about three years old at this point (based on the 2009 audit), and as Village Clerk Sharyn Bower pointed out in the Record-Patriot, “Our auditor said our 2010 audit was much better.” Further, the approved Village budget for 2011/12 entails significant cuts, including a total of $73,298 in cuts to the general fund, streets, sewer, and garbage funds; the elimination of one our DPW employee positions; and the elimination of spousal benefits for our Village employees. Stanton said the factors cited in the fiscal indicator scores “are not considered predictive” of whether Elberta will hit enough triggers to require intervention. Nevertheless, we should all be aware that our house does not seem to be in order. The 2009 audit revealed our revenues at $228,198 and our expenditures at $267,002. More startlingly, as of the 2009 audit we had a major fund deficit of $742,954, according to the Treasury Department breakdown. Failure of the marina and condominium development by the Elberta Landholding Co. (ELHC) to materialize and thereby become a solid tax base. According to Sharyn Bower, whom the Alert reached today, ELHC pays $15,900 in property taxes to the Village each year, and has been doing so since 2000. Before that, the property was owned by MDOT and therefore did not produce any tax revenue at all. So in fact, for the past ten years the Village has enjoyed a net gain in property taxes, albeit not the huge projected earnings expected to result from the multimillion dollar development. “added expenses from the City of Milwaukee docked in Betsie Bay at the old carferry slip for a number of years.” At posting time, the Alert was not able to ascertain the nature of these added expenses. The City of Milwaukee, a national historic landmark, left Elberta’s port after being moored in Betsie Bay from 1981 to January of 2000. It’s now moored in Manistee. “having to clean up after lead and asbestos was discovered when the Waterfront Park was being developed.” At posting time, the Alert was not able to ascertain the amount of money required for this cleanup. “the fact that the land on the east end of the bay in Elberta is not on the tax rolls anymore after a Native American group that owned the property appealed to the State.” The Grand Traverse Band of Chippewa and Ottawa Indians, which owns the property, paid approximately $9,900 per year in taxes up until this year’s (2010) winter tax, meaning we have only just begun to lose this revenue. “the tiny village has a lot of parkland that needs to be constantly maintained” For a Village our size, we do have an enormous amount of parkland, and currently only one full-time employee to oversee its maintenance. This problem will increase when the Village takes over the maintenance of the nearly two-mile stretch of M-168 when it is transferred to us from MDOT, sometime this summer.